The spinner is a rotating element in your medal. The spinner is connected to the medal by two pins. By giving a push against the element with your finger, it spins around. It is even possible to produce multiple spinners in one medal! The spinner is ideal to draw extra attention, for example extra attention for your (main) sponsor. The spinner is a real eye-catcher. A good example is the medal for running program Start to Run of the Athletics Union with main sponsor Yakult. The Yakult bottle is perfect to design as a spinner element. 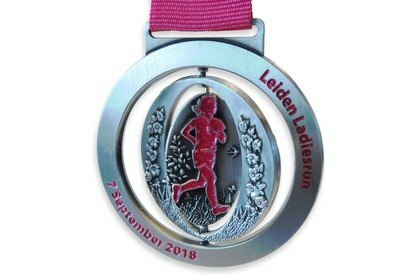 Are you looking for a unique medal for your Kids Run? Then the medal with spinner is an original option! 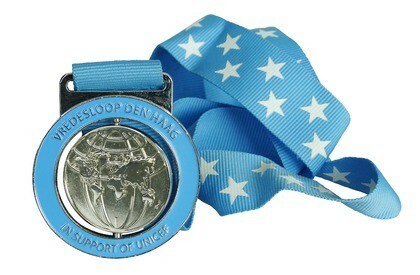 For children it is very nice that the medal contains a moving element.